The complaint often arises with anime that the voices all sound the same. So how does it sound when you have one voice actress having a conversation with themselves? The anime Kantai Collection, based on the game of the same name, features anthropomorphized battleships. Each of the characters that appears in the series is based on an actual WWII battleship. In both the anime and game, various voice actresses play the part of multiple characters. Perhaps it's to keep the costs of hiring tons of voice actresses down. What this inevitably results in is characters voiced by the same actress running into each other and having conversations. Check out some of the one-sided conversations from Kantai Collection below. Voice actress Yuka Otsubo lends her voice to the characters Kitakami and Oi. In the following clip, Kitakami and Oi are talking about food that Kitakami likes. It sounds like two people, but in the recording studio it's the same person talking herself! Nao Touyama [Edit: Got the name wrong. Thanks for pointing that out, guys] voices several characters within the anime, but most notable are the Kongo sisters, Kongo, Hiei, Haruna, and Kirishima. In the following clip, the sisters all introduce themselves. Each sister has a very distinct personality that sets her apart from the others, but again, it's the same person voicing every one of them! 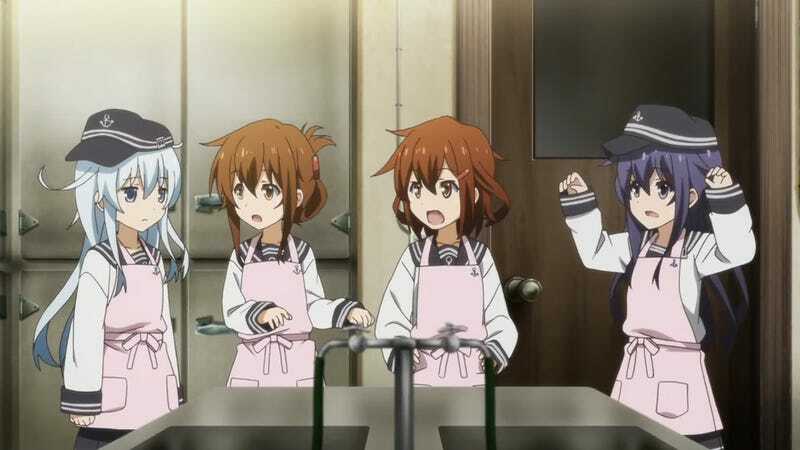 Aya Suzaki voices the Akatsuki-class fleet girls, Akatsuki, Hibiki, Ikazuchi, and Inazuma. In the following clip, the four have entered a curry-making contest together. Four girls (two are twins, so it's a bit of a cheat) but one voice actress to voice them all. Voice actress Ayane Sakura lends her voice to the characters Nagato, Mutsu, Sendai, Jintsu, and Naka. In the following clip Nagato, the lead fleet girl, ponders battle tactics following a recent conflict and discusses it with Mutsu, who once again is being voiced by the same person. And in the last clip, Sendai, Jintsu, and Naka are discussing the newest member of the fleet, Fubuki, when they are joined by Nagato. But it's all the same person! Kantai Collection is currently airing on TV in Japan. People outside Japan can catch it on crunchyroll.